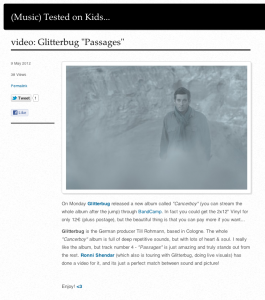 Glitterbug is the German producer Till Rohmann, based in Cologne. The whole “Cancerboy” album is full of deep repetitive sounds, but with lots of heart & soul. I really like the album, but track number 4 – “Passages” is just amazing and truly stands out from the rest. Ronni Shendar (who also is touring with Glitterbug, doing live visuals) has done a video for it, and its just a perfect match between sound and picture! This entry was posted on Thursday, May 10th, 2012 at 2:55 pm and is filed under Press / Reviews. You can follow any responses to this entry through the RSS 2.0 feed. Responses are currently closed, but you can trackback from your own site.